They seek him there, but those Frenchies are having a devil of a time catching up with the Scarlet Pimpernel. This adaptation of the classic story by Baroness Orczy was produced in 1982 and stars Anthony Andrews, Jane Seymour and Ian McKellen. The lovely costumes and beautiful sets make this a thoroughly enjoyable viewing experience. The story takes place during the height of the French Revolution. Entire families are being sent to the guillotine for the "crime" of being aristocratic. One man, the unknown Scarlet Pimpernel, makes it his mission to smuggle out as many people as he can to save them from this terrible fate. His identity is unknown, but it is known that he is an Englishman, and likely to be from the upper-classes himself. How is the Scarlet Pimpernel able to perform his daring feats without being detected? He is a master of disguise and also has a small band of loyal assistants who have been sworn to secrecy. We are soon introduced to Sir Percy Blakeney, Baronet, whose only interests seem to be buying fine clothing and attending society events. He is a foppish fool, delighting gatherings with his poetry, insulting the clothing of others and generally playing the idiot. But this, we soon learn, is one of his many disguises. 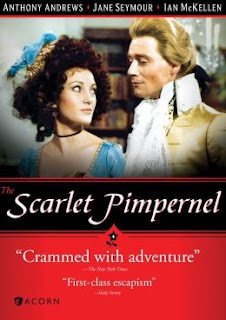 For yes, Percy is the Scarlet Pimpernel. While in Paris on one of his rescue missions, he meets the actress Marguerite St. Just and falls madly in love. Marguerite has also caught the eye of one of Robespierre's underlings, the scheming Paul Chauvelin. Chauvelin believes that Marguerite will soon marry him, but Marguerite has become infatuated with Sir Percy. In defiance of her powerful admirer, Marguerite agrees to marry Percy. 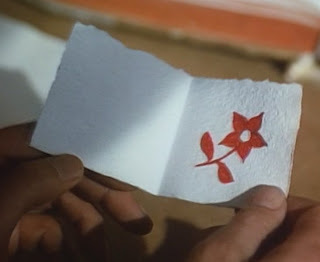 In a fit of anger, Chauvelin signs Marguerite's name to a paper denouncing a wealthy family so that it appears she is the one responsible for their deaths. Word of this action reaches Percy, who believes that Marguerite did indeed commit the foul action. This creates a rift between the newly married couple. Marguerite knows her husband's feelings toward her have changed, but she has no idea why, and Percy feels he can no longer trust his bride. Meanwhile, the Scarlet Pimpernel is planning his most daring rescue yet: that of King Louis XVI's and Marie Antoinette's son who is currently imprisoned. The boy is guarded around the clock, so it looks like an impossible mission, but if anyone can pull it off, it's the Scarlet Pimpernel! Will the prince be rescued? Will the misunderstanding between Percy and Marguerite be resolved? Will the Scarlet Pimpernel live to fight another day? Will Percy maintain his exquisite wardrobe? All these questions are answered in a suspenseful, exciting conclusion! I really enjoyed the performances in this production. Jane Seymour is lovely as always and Anthony Andrews is perfect in the dual role as the swashbuckling Scarlet Pimpernel and the foolish Sir Percy. You can even almost have sympathy for the villain Chauvelin, played by Ian McKellen, due to his being thwarted in everything he tries to do. This really was a wonderful adaption of the story! I must day, though, I'm glad the fashion for "sideways hair" has died out!